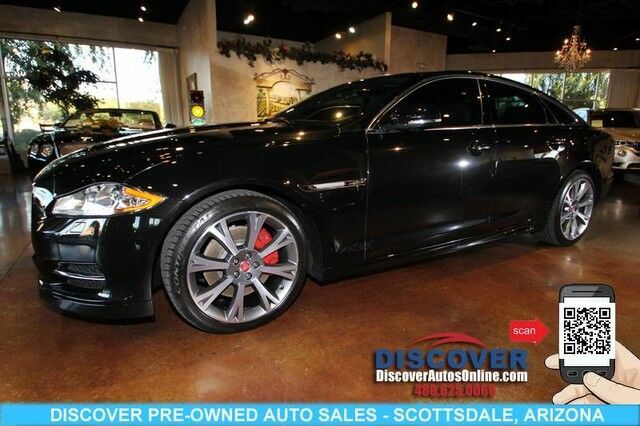 Discover Pre-Owned Auto Sales of Scottsdale Arizona is pleased to offer this beautiful 2015 Jaguar XJ Supercharged Sedan 4D with only 28,492 miles. Your buying risks are reduced thanks to a CARFAX BuyBack Guarantee. Is it possible to fall in love with a vehicle? It is when your vehicle is as prestige as the Jaguar XJ. This highly refined Jaguar XJ comes with exciting features you'd expect in a vehicle twice the price. When all factors are equal, choose a vehicle equipped with a factory warranty like this gently driven gem. Added comfort with contemporary style is the leather interior to heighten the quality and craftsmanship for the Jaguar XJ You can take the guesswork out of searching for your destination with this Jaguar XJ 's installed Navigation system. This vehicle comes with upgraded wheels for improved performance. This Jaguar includes: JET/IVORY, SOFT-GRAIN LEATHER SEAT TRIM Leather Seats CARBON FIBER VENEER TRIM WHEELS: 20" ORONA 8-SPOKE ALLOY Tires - Front Performance Aluminum Wheels Tires - Rear Performance ULTIMATE BLACK METALLIC RADIO: MERIDIAN 825W PREMIUM SURROUND SOUND SYSTEM HD Radio CD Player AM/FM Stereo Satellite Radio Premium Sound System Hard Disk Drive Media Storage MP3 Player JET SUEDECLOTH HEADLINER *Note - For third party subscriptions or services, please contact the dealer for more information. * At DiscoverAutosOnline.com , we strive to provide you with the best quality vehicles for the lowest possible price, and this Jaguar XJ Sedan is no exception.